RadPropertyGrid exposes EditMode property of type PropertyGridEditMode, which provides different options for editing behavior. As to configuring RadPropertyGrid and assigning an Item to it, please check the Getting Started with RadPropertyGrid help article. All PropertyGridFields editors are accessible from the UI and the correctness of an edit operation is ensured only by the data-binding mechanism. There are not distinct visual states of PropertyGridField that indicate whether it is being currently edited, or not. When a validation error occurs, users are not encouraged to fix it, or cancel their change, by blocking the UI. It relies on PropertyDefinition’s Binding property. 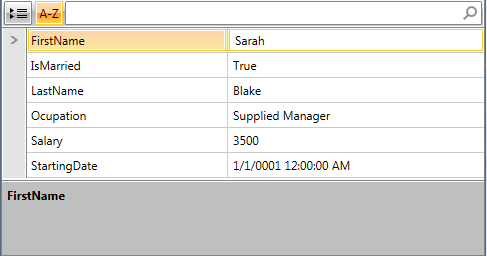 Setting this mode is not supported with dynamic data or when Property-Sets are defined. Single EditMode is supported only when RenderMode is set to Flat. For more information on the different rendering modes, please check the Layout Rendering Modes article. The BeginningEdit and EditEnded events are raised only if the EditMode property is set to Single. BeginEdit(): Starts an edit operation for the current PropertyDefinition. BeginEdit(PropertyDefinition propertyDefinition): Starts an edit operation for the PropertyDefinition that is passed as a parameter. 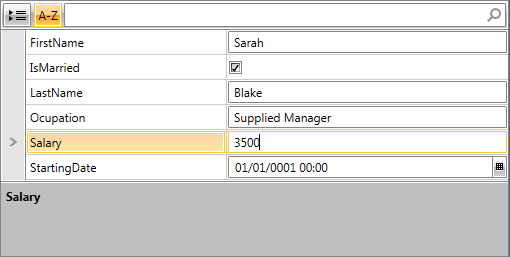 Then PropertyGridField’s display content (TextBlock) is replaced by an editor. CommitEdit: Tries to change the value of the bound property. First, it invokes the validation logic (raising the Validating, Validated events). CancelEdit: Reverts the old value without validating the new ones. Both operations result in raising of the EditEnded event, which indicates the executed operation and the Old and New value after it. These edit actions are integrated with RadPropertyGrid’s Keyboard navigation (i.e. clicking on a display TextBlock triggers edit, pressing Esc cancels edit etc).